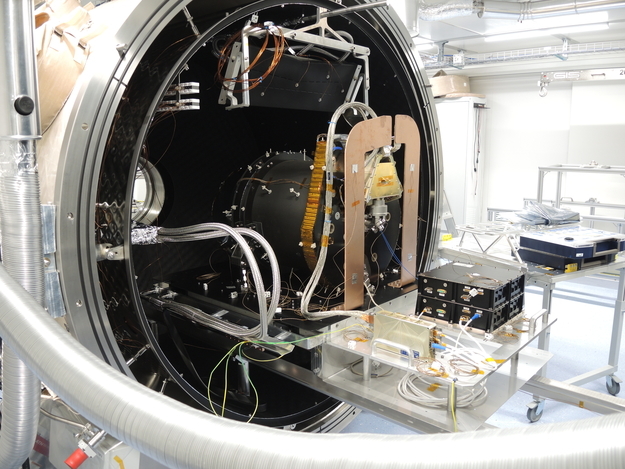 The CHEOPS scientific instrument is pictured here being loaded into the thermal vacuum chamber at the University of Bern, for testing. The instrument consists of a photometer with a single CCD, operating between 0.4 µm and 1.05 µm, that is at the focal plane of an on-axis Ritchey-Chrétien telescope of 33 cm diameter. In the picture, the telescope tube points towards a window in the chamber through which light can be offered during testing. Light entering the telescope is detected by the bronze-coloured Focal Plane Module (FPM), which houses the CCD detector array and the Front-End Electronics. These tests are carried out to ensure that the alignment of the FPM performed in ambient conditions results in correctly focussed images once in orbit.